While attending the Cannes Film Festival where Swinton is one of twelve judges this week, Andrew Adamson confirmed that Swinton has indeed been chosen to play the role of Narnia’s evil White Witch. Many had hoped that Nicole Kidman would be chosen to play the White Witch, but the production has said repeatedly that she was never even considered. 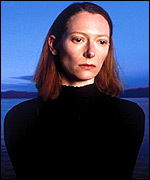 By all accounts, Tilda Swinton is an excellent actress and will fill the role perfectly. This is the first official casting announcement from the production of The Lion, the Witch, and the Wardrobe.